Here are the questions, answers, and explanations from our 3-bet pots quiz. The button will still have many hands that have missed this flop, and so if we fold instead of call we would end up folding too much of our range, thus giving him an amazing bluff opportunity. Even though the K♠ is one the worst cards in the deck for our range, folding here would be a blunder since the button can still have a lot of hands that will bluff (such as AQ, AJ, A3, A2, 76s, etc.). Letting go of this hand would mean conceding the pot way too often. Calling here would be a mistake because AQ will not realize it’s equity given that it only improves if the turn is an Ace or a Queen. We have King-high with two overs and a backdoor flush draw, so there are enough turns that will allow us to continue and realize our equity. Folding here would be a big misstep. We are at the top of our range, we block the nut flush, and our opponent could easily find more than enough bluffs. Folding is not an option here unless we have a solid read that the button will under-bluff in this spot. Our hand has become too weak on the turn to continue since the button has another 6 outs to beat even if he is bluffing (any 6 or T makes our hand a 4-high). Even with a hand as handsome as 2nd pair and an open-ended straight draw, we cannot profitably continue after the Q♠ turn, because even if we improve on the river there is a good chance we’ll be up against a much stronger hand. That could result in a costly mistake. 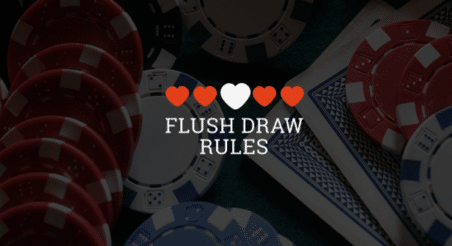 We binked the flush, but that’s not a reason to start raising right away. Given the low stack to pot ratio, and the fact that we are in position, we will make more chips by calling and letting our opponent bluff or value bet worse hands on the river. We simply cannot fold a hand that is so high up in our range without good evidence to do otherwise. Yes, the button can have JJ+, but he will also have a lot of missed hands from the flop with which he will fire all three streets at some frequency.